Call me a doubter, but I've seen this before. 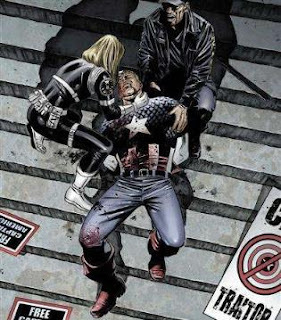 The most recent issue of Captain America has the beloved character gunned down on the steps of a court-house, seemingly assassinated he's now dead. Forever. Finito. The book is generating a lot of interest, both in the comic book world and also in the mainstream media. Or is he? It's not like this stunt is anything new is it? NEXUS FREE COMIC BOOK DAY! Rude Dude Productions announced Nexus Special for Free Comic Book Day a success. Pheonix, AZ – March 8, 2007 – Rude Dude Productions announced today that their sales for Free Comic Book Day Nexus are inline with IDW and Image books, which is a significant benchmark for the new company. Rude Dude also reminded retailers that they still have until March 15th to order the award winning book. 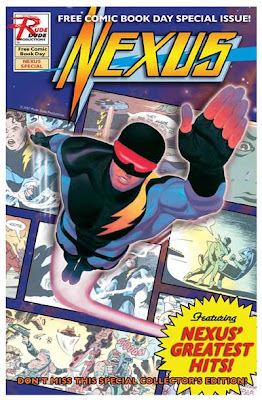 The new Nexus mini-series will premiere in July and the Free Comic Book Day issue is a great introduction for new readers. Free Comicbook Day promotional posters will be sent to the top 1,000 retail orders, the top 10 retail orders will receive goodie baskets that will include cookies (both homemade and girlscout), free comic book day promotional items, Steve Rude books and prints. As an addition to the above and as a thank you for the orders, any retailer with an order over 500 copies will receive a piece of original art! So I've decided to take the advice of Tony Isabella and actually put together some projects as POD. Tony suggested it to me in an email not so long ago and it did get me thinking, mainly, can it be done? Well anything can be done, as my dear ole ma used to say (and still does, only she doesn't clip me around the ears that much anymore) but here's the problem - what POD company offers the best deals? I'm expecting that I might end up going with someone like Lulu but bugger me it's not cheap is it? Is there a POD company set up in Australia?